You're strictly watching your portions, choosing healthier foods and walking every chance you get. Know that the scale isn't the only way to measure the effects of these changes. Your body will send signals that weight loss is happening. 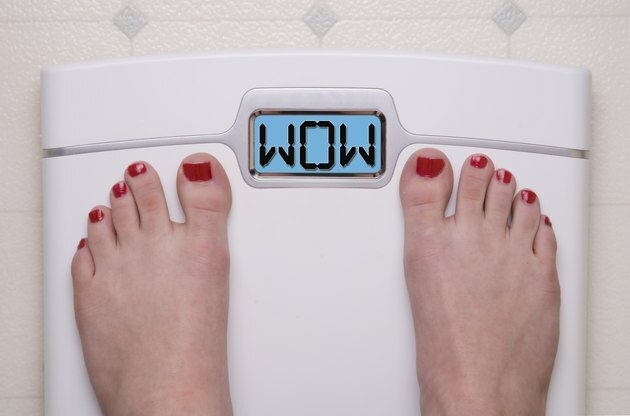 Instead of being beholden to achieving a certain "number," tap into your energy levels and health for clues that you're starting to lose weight. In the first couple of days of your diet plan -- as you make healthier choices and reduce your intake of processed foods, refined grains and sugars -- you lose water weight. This shows up on the scale, but also as reduced puffiness and bloating, so your clothes hang more smoothly and feel more comfortable. You'll notice that your jeans zip up more easily. You may even need to tighten your belt another notch. A pencil skirt might stretch less tightly across your rump. Even your boots may slide more easily over your calves. No one knows your body like you do. When you lose weight, you'll notice a slimmer torso, smaller hips or more slender arms in the mirror. You may even notice a reduction in volume in your cheeks. You'll see these changes before other people do, and that's OK, because you're losing weight to feel healthier for you. Photographs are another marker of weight loss. Small changes aren't always evident on a day-to-day basis, but compare selfies taken a few weeks apart. If you're dropping pounds, you'll see that your face has slimmed and your belly has deflated. Everyday tasks reveal how far you've come in your weight-loss journey. You'll feel lighter and more able to do mundane chores, like carrying a load of laundry up the stairs or picking up after kids and pets. These markers of weight loss show the real-life positive impact that healthier eating, moderate portions and exercise can provide. If you regularly exercise, you might also find that you're faster and more powerful. You may run or cycle faster with the same effort, for example, because you're carrying less weight. If you were overweight to begin with, blood pressure and blood cholesterol numbers tend to improve when you lose just 5 to 10 percent of your total body weight. For a 200-pound person, that means a loss of 10 to 20 pounds. Your doctor can run these tests as part of a routine screening. You may also notice changes in your body fat percentage. Get it checked with a specialized scale found in some fitness centers or by a professional who uses skinfold calipers to pinch various sites before plugging the numbers into an equation. When your body fat declines, you've lost fat even if putting on muscle results in the scale showing minimal lowering of your weight. Muscle is a much healthier tissue and more compact than fat, so you'll feel and look better. A tape measure can further confirm that you've dropped weight. Measure sites such as your waist, upper arms and thighs to see if they're shrinking. For example, when your waist shrinks, you know you've lost belly fat, a particularly dangerous type of fat which collects around the internal organs and releases inflammatory compounds. Seek to shrink your waist below 40 inches if you're a man and below 35 inches if you're a woman. How Long Before a Positive Change in Diet Starts to Take Effect? Why Am I Gaining Weight If I'm Going to Gym?